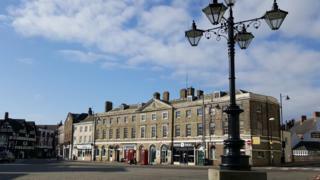 Lincolnshire voters were among the most Eurosceptic in the UK, with more than 75% of voters in Boston voting to leave. The town recorded the highest majority of Brexit voters in Britain. Other parts of Lincolnshire also saw a high proportion of Leave voters, with South Holland and East Lindsey both posting figures of more than 70%. Remain campaigner and Conservative MP for Boston and Skegness, Matt Warman, said the decision had to be respected. Parts of the county have in recent years seen an influx of EU workers drawn to the area's agricultural industry. The 2011 census found about 13% of residents in Boston were born in the EU and were largely Eastern-European migrants who arrived after 2004. One Lithuanian worker told the BBC he was "a little shocked" by the result. "I suppose it depends what they are going to do with all the people from other countries," he said. "I hope it will be all right, but we don't know. Now we are waiting." Another woman, who did not want to be named, said the result was "a positive step for the country". "Now we can be led by people who have this best interests at heart, not Europe," she said. "It's not all about immigration, which is what every politician has made it look like, it's about other things as well." Mr Warman added: "We've got to respect the fact that if people want to take that gamble then we have to get the best deal for the country."